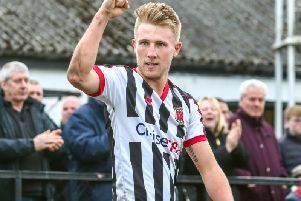 Chorley skipper Andy Teague believes victory over derby rivals AFC Fylde tomorrow could be the catalyst for a title push. The Magpies travel to Kellamergh Park this weekend in sixth spot in the Conference North – 17 points behind the Coasters, who sit proudly at the top of the table. But Teague knows through past experience that there is still plenty of time for he and his team-mates to catch Dave Challinor’s men. “If you look at last season, we were something like 15 or 16 points ahead of FC United and they managed to claw it back to just one point at the end of the season. “Look at Fylde last season – they were on a bad run when we beat them at Victory Park, then re-signed Richie Allen and went on a great run. I don’t think they lost a game and they finished third. “We are really looking forward to the game tomorrow. “There’s a big rivalry between the two teams and they are flying at the top of the league. “It’s up to us to catch them. We’ve still got to play them twice this season. “If we can win tomorrow, I think it will give us that extra incentive. “We have a few games in hand. If we can get to within 10 points behind, there’s still half the season to go. The Magpies returned to winning ways with a veangence last weekend as Gainsborough Trinity were put to the sword 4-1 at Victory Park. It was only the second league match the team has played since Boxing Day and it also saw manager Garry Flitcroft hand debuts to new signings Matthew Flynn and Arron Burns. Striker Burns scored the opening goal while Flynn formed a solid partnership with Teague in the centre of defence. “A couple of new signings have come into the team and given everybody a big lift. It’s refreshed the squad,” he added. Meanwhile, in the Conference Premier, Southport will be aiming to put more daylight between themselves and the relegation zone when they host Gateshead.